GM’s Silverado is entirely new for 2019 and will offer six engine options, one of which is a 3.0L Duramax diesel. The diesel powertrain has always been a great necessity for the American driver but perhaps never garnered the love and recognition it truly deserves. Most appreciated for its functionality around the farm and on the jobsite, diesel is the fuel of choice for many fullsize trucks, utility vans and other heavy-duty work vehicles. But while many are quick to reserve the application of diesel power sources solely to those work vehicles, the market shows a thirst for more applications. Once considered a more polluting, noisier alternative to the typical combustion engine in the ’70s and ’80s, diesel powertrains nevertheless earned a place under the hoods of commercial vehicles across the United States. After decades of refinement and development, the current U.S. diesel market is still largely composed of the same utility vehicles it was founded on, but the desire to further diesel’s presence in other vehicle classes is an expanding school of thought. In terms of diesel powertrain production at the OEM level, the story differs depending on where you look. Volkswagen AG—plagued by an overarching scandal in recent years—has temporarily ended all diesel offerings in the United States. Whether the company chooses to ever bring back its diesel lineup, known as TDI, still remains to be seen. Another major German automaker, Mercedes-Benz, has also significantly scaled back its Bluetech diesel offerings in the United States, instead choosing to focus on hybrid powertrain technology. Additionally, Japanese companies, such as Honda and Toyota, avoid the diesel powertrain altogether with their U.S. vehicles, instead focusing on hybrid and hydrogen technologies. However, major American manufacturers are embracing diesel and expanding its presence more than ever before. The 2017 auto-show circuit hosted several diesel announcements, including for the Ford F-150, Chevrolet Silverado 1500 and Jeep Wrangler. The Jeep Wrangler will receive a diesel engine option for the first time in the model’s history. Touting the term “first ever,” Ford announced a Power Stroke diesel option for the ’18 F-150, marking the first time a diesel powertrain has ever been available in the truck. The engine will be good for an impressive 440 lb.-ft. of torque and perhaps an even more impressive 30 mpg on the highway. Not to be outdone by Ford, GM’s Silverado is entirely new for 2019 and will offer six engine options, one of which is a 3.0L Duramax diesel. Tom Read, a communications officer for GM Global Propulsion Systems, highlighted the need for diversity in powertrain options. Perhaps the biggest diesel-related announcement thus far in 2018 comes from FCA, which declared a diesel powertrain for Wrangler—marking the first time ever that Jeep’s halo car has used the technology. Expected to produce more than 440 lb.-ft. of torque, the four-cylinder diesel option will bring a newfound engine iteration to a Wrangler community that has requested differentiation and more engine choices for some time. Even in the midst of European and Japanese carmakers shying away from diesel products on U.S. soil, the Big Three American automotive giants are saying otherwise, laying out plans to keep diesel in their lineups. As both Read and Jones mentioned, it goes back to customer choice. Sales trends and customer feedback have been strong enough to warrant diesel variants of some of the most popular cars and trucks on the road, thus easing the worry that diesel was facing a crisis in the U.S. market. Houston-based retail shop PSP Diesel can attest firsthand to diesel’s growth, working on a variety of makes and models in the truck segment. Just as the market grows for new diesel vehicles, the automotive aftermarket is seeking its share of diesel enthusiasts. SEMA’s market research shows more than 6 million diesel trucks in operation today in the United States. Millions more vans, SUVs and sedans add to that total, creating an expansive aftermarket opportunity. Jones and his editorial team at Diesel Power have monitored the aftermarket’s growth and persistence in creating a myriad of quality products for diesel applications. Houston-based retail shop PSP Diesel can attest firsthand to diesel’s growth—especially in the truck segment. 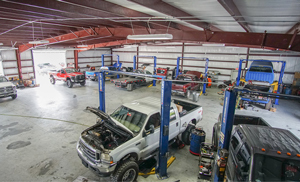 The shop opened in 2010 as a Power Stroke specialty shop dedicated to diesel expertise and customer support. It didn’t take long for the expanding customer base to demand Duramax and Cummins services, which the shop now obliges. Stephen Peters, director of operations for PSP, outlined diesel’s growing importance to the aftermarket. Peters’ assertion that diesel has grown into a segment that is equal parts performance and practical speaks directly to new products available for such vehicles. Today’s ideal situation, said Peters, is one in which an owner can enhance the powertrain’s performance without much sacrifice in the name of efficiency and reliability. Echoing Jones’ statements on top-selling products, PSP noted increased sales with aftermarket intakes, engine programmers, fuel-pump kits and exhaust systems. “The pricing on those items is fairly reasonable, and installation times won’t leave the truck down for an extended period,” Peters concluded. Some of the hottest-selling aftermarket diesel products are cold-air intakes and fuel control systems. Like the OEMs, aftermarket diesel suppliers face stringent emissions-compliance regulations. Consequently, the segment’s growth has prompted the SEMA Garage to expand its current emissions-compliance testing to include diesel capabilities. SEMA Compliance Center Manager Peter Treydte outlined the Garage’s latest upgrades. The SEMA Garage now offers auto-parts manufacturers diesel emissions-compliance testing. In other words, for companies that offer diesel performance parts with their portfolios, the SEMA Garage is now a viable option to ensure that all products fall within CARB compliance. In speaking with representatives from all corners of the diesel industry—OEM, retailer, media and manufacturer—the consensus is that while diesel may never become the go-to power source for the majority of vehicles, its future is guaranteed by keeping efficiency and compliance at the forefront of all endeavors. The necessity for compliance only heightens as enthusiasts add aftermarket components of their choosing to increase functionality and capability. With the right steps in motion already at the OEM level to enhance fuel efficiency and torque figures—along with new vested stakes in diesel emissions certification for the aftermarket from the SEMA Garage—the path to a healthy, thriving diesel market becomes a more attainable and even probable reality.